International Chocolate Day is observed on 13 September. Chocolate is a processed, typically sweetened food produced from the seed of the tropical Theobroma cacao tree. Cacao has been cultivated for at least three millennia in Mexico, Central America and Northern South America. Its earliest documented use is around 1100 BC. The majority of the esoamerican people made chocolate beverages, including the Aztecs, who made it into a beverage known asxocolātl , a Nahuatl word meaning “bitter water”. The seeds of the cacao tree have an intense bitter taste, and must be fermented to develop the flavor.After fermentation, the beans are dried, then cleaned, and then roasted, and the shell is removed to produce cacao nibs. The nibs are then ground to cocoa mass, pure chocolate in rough form. Because this cocoa mass usually is liquefied then molded with or without other ingredients, it is called chocolate liquor. The liquor may also be processed into two components: cocoa solids and cocoa butter. Unsweetened baking chocolate (bitter chocolate) contains primarily cocoa solids and cocoa butter in varying proportions. Much of the chocolate consumed today is in the form of sweet chocolate, combining cocoa solids, cocoa butter or other fat, and sugar. Milk chocolate is sweet chocolate that additionally contains milk powder or condensed milk. 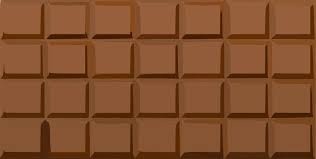 White chocolatecontains cocoa butter, sugar, and milk but no cocoa solids.Cocoa solids contain alkaloids such as theobromine, phenethylamine and caffeine. These have physiological effects on the body and are linked to serotonin levels in the brain. Some research found that chocolate, eaten in moderation, can lower blood pressure. The presence of theobromine renders chocolate toxic to some animals, especially dogs and cats.Chocolate has become one of the most popular food types and flavors in the world, and a vast number of foodstuffs involving chocolate have been created. Chocolate chip cookies have become very common, and very popular, in most parts of Europe and North America. Gifts of chocolate molded into different shapes have become traditional on certain holidays. Chocolate is also used in cold and hot beverages, to produce chocolate milk and hot chocolate.Cocoa mass was used originally in Mesoamerica both as a beverage and as an ingredient in foods. Chocolate played a special role in both Maya and Aztec royal and religious events. Priests presented cacao seeds as offerings to the deities and served chocolate drinks during sacred ceremonies. All of the areas that were conquered by the Aztecs that grew cacao beans were ordered to pay them as a tax, or as the Aztecs called it, a “tribute”.The Europeans sweetened and fattened it by adding refined sugar and milk, two ingredients unknown to the Mexicans. By contrast, the Europeans never infused it into their general diet, but have compartmentalized its use to sweets and desserts. In the 19th century, Briton John Cadbury developed an emulsification process to make solid chocolate, creating the modern chocolate bar. Although cocoa is originally from the Americas, today Western Africa produces almost two-thirds of the world’s cocoa, with Côte d’Ivoire growing almost half of it. The first European contact with chocolate came when Montezuma (then tlatoani ofTenochtitlan) introduced Hernán Cortés, a Spanish conquistador, to xocolatl in the 16th century. Antonio de Solís, Philip IV’s official Chronicler of the Indies, described Montezuma customarily taking a chocolate beverage after meals, as part of a sumptuous daily ritual and.c hocolate has been used as a drink for nearly all of its history. The earliest record of using chocolate dates back before the Olmec. In November 2007, archaeologists reported finding evidence of the oldest known cultivation and use of cacao at a site in Puerto Escondido,Honduras, dating from about 1100 to 1400 BC.the residues found and the kind of vessel they were found in indicate the initial use of cacao was not simply as a beverage, but the white pulp around the cacao beans was likely used as a source of fermentable sugars for an alcoholic drink. The Maya civilization grew cacao trees in their backyards, and used the cacao seeds the trees produced to make a frothy, bitter drink. Documents in Maya hieroglyphs stated chocolate was used for ceremonial purposes, in addition to everyday life. The chocolate residue found in an early ancient Maya pot in Río Azul, Guatemala, suggests the Maya were drinking chocolate around 400 AD. Mayan writing referring to cocoa. The sweet chocolate residue found in jars from the site of Puerto Escondido in Honduras from around 1100 BC is the earliest found evidence of the use of cacao to date. An early Classic (460–480 AD) period Mayan tomb from the site of Rio Azul, Guatemala, had vessels with the Maya glyph for cacao on them with residue of a chocolate drink. The Maya are generally given credit for creating the first modern chocolate beverage over 2,000 years ago, despite the fact that the beverage would undergo many more changes in Europe. By the 15th century, the Aztecs gained control of a large part of Mesoamerica, and adopted cacao into their culture. They associated chocolate with Xochiquetzal, the goddess of fertility, and often used chocolate beverages as sacred offerings. The Aztec adaptation of the drink was a bitter, frothy, spicy drink called xocolatl, made much the same way as the Mayan chocolate drinks. It was often seasoned with vanilla, chile pepper, and achiote, and was believed to fight fatigue, which is probably attributable to the theobromine content, a mood enhancer. Because cacao would not grow in the dry central Mexican highlands and had to be imported, chocolate was an important luxury good throughout the Aztec empire, and cocoa beans were often used as currency. For example, the Aztecs used a system in which one turkey cost one hundred cacao beans and one fresh avocado was worth three beans. South American and European cultures have used cocoa to treat diarrhea for hundreds of years. All of the areas ruled by the Aztecs were ordered to pay a tax, leading those that grew the beans to offer cacao seeds as tribute. The first recorded shipment of chocolate to Europe for commercial purposes was in a shipment from Veracruz to Sevilla in 1585.It was still served as a beverage, but the Europeans added cane sugar to counteract the natural bitterness and removed the chili pepper while retaining the vanilla, in addition they added cinnamon as well as other spices. What the Spaniards then called “chocolatl” was said to be a beverage consisting of a chocolate base flavored with vanilla and other spices that was served cold. Montezuma’s court reportedly drank about 2,000 cups of xocolatl per day, 50 of which were consumed by Montezuma himself.Until the 16th century, no European had ever heard of the popular drink from the Central and South American peoples. It was not until the Spanish conquest of the Aztecs that chocolate could be imported to Europe. In Spain, it quickly became a court favorite. In a century it had spread and become popular throughout the European continent.To keep up with the high demand for this new drink, Spanish armies began enslaving Mesoamericans to produce cacao. Even with cacao harvesting becoming a regular business, only royalty and the well-connected could afford to drink this expensive import. Before long, the Spanish began growing cacao beans on plantations, and using an African workforce to help manage them. The situation was different in England. Put simply, anyone with money could buy it.The first chocolate house opened in London in 1657. In 1689, noted physician and collector Hans Sloanedeveloped a milk chocolate drink in Jamaica which was initially used by apothecaries, but later sold to the Cadbury brothers in 1897. For hundreds of years, the chocolate-making process remained unchanged. Then in the 18th century, mechanical mills were created that squeezed out cocoa butter, which in turn helped to create hard, durable chocolate. But, it was not until the arrival of the Industrial Revolution that these mills were put to bigger use. Not long after the revolution cooled down, companies began advertising this new invention to sell many of the chocolate treats we see today. When new machines were produced, people began experiencing and consuming chocolate worldwide. At the end of the 18th century, the first form of solid chocolate was invented in Turin by Doret. This chocolate was sold in large quantities from 1826 by Pierre Paul Caffarel in Italy. In 1819, F. L. Cailler opened the first Swiss chocolate factory. In 1828, Dutchman Coenraad Johannes van Houten patented a method for extracting the fat from cocoa beans and making powdered cocoa and cocoa butter. Van Houten also developed the “so-called” Dutch process of treating chocolate with alkali to remove the bitter taste. This made it possible to form the modern chocolate bar. The German company Jordan & Timaeus sold the first known chocolate bar made from cocoa, sugar and goat’s milk in 1839. In England, the company, J. S. Fry & Sons discovered a way to mix some of the cocoa butter back into the Dutched chocolate, and added sugar, creating a paste that could be moulded. This led to the first British chocolate bar in 1847, followed in 1849 by the Cadbury brothers.In 1865, an unknown employee at the Ghirardelli Chocolate Company discovered the Broma process of separating cocoa butter from cocoa solids (namely, that if chocolate is hung in a bag in a warm room, the butter will drip out naturally over time).Daniel Peter, a Swiss candle maker, joined his father-in-law’s chocolate business. In 1867, he began experimenting with milk as an ingredient. He brought his new product, milk chocolate, to market in 1875. He was assisted in removing the water content from the milk to prevent mildewing by a neighbour, a baby food manufacturer named Henri Nestlé. Rodolphe Lindt invented the process called conching, which involves heating and grinding the chocolate solids very finely to ensure that the liquid is evenly blended. This enabled Milton Hershey to make chocolate even more popular by mass-producing affordable chocolate bars. Best known for his wonderfully outlandish illustrations of all sorts of wierd & wonderful contraptions, the English cartoonist W. Heath Robinson, sadly passed away on 13th September 1944. 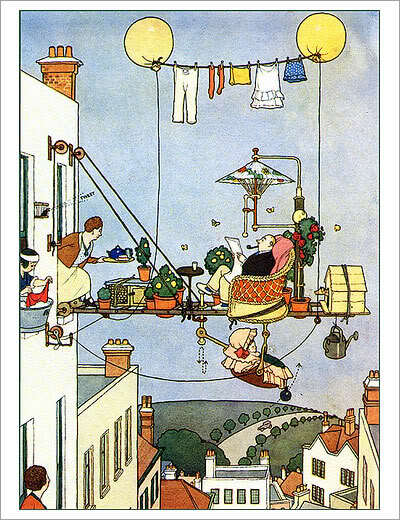 In the UK, the term “Heath Robinson” has entered the language as a description of any unnecessarily complex and implausible contraption, similar to “Rube Goldberg” in the U.S. Born into a family of artists His father and brothers (Thomas Heath Robinson and Charles Robinson) all worked as illustrators. Robinson’s early career involved illustrating books – among others: Hans Christian Andersen’s Danish Fairy Tales and Legends (1897); The Arabian Nights, (1899); Tales From Shakespeare (1902), and Twelfth Night (1908), Andersen’s Fairy Tales (1913), A Midsummer Night’s Dream (1914), Charles Kingsley’s The Water-Babies (1915), and Walter de la Mare’s Peacock Pie (1916). In the course of his work Heath Robinson also wrote and illustrated three children’s books, The Adventures of Uncle Lubin (1902), Bill the Minder (1912) and Peter Quip in Search of a Friend (1922). Uncle Lubin is regarded as the start of his career in the depiction of unlikely machines. During the First World War he drew large numbers of cartoons, collected as Some “Frightful” War Pictures (1915), Hunlikely! (1916), The Saintly Hun (1917) and Flypapers (1919), depicting ever-more-unlikely secret weapons being used by the combatants. He also produced a steady stream of humorous drawings for magazines and advertisements. In 1934 he published a collection of his favourites as Absurdities, such as: “The Wart Chair. A simple apparatus for removing a wart from the top of the head”, “Resuscitating stale railway scones for redistribution at the station buffets” and “The multimovement tabby silencer”, which automatically threw water at serenading catsMost of his cartoons have since been reprinted many times in multiple collections, and the machines he drew were frequently powered by steam boilers or kettles, heated by candles or a spirit lamp and usually kept running by balding, bespectacled men in overalls. There would be complex pulley arrangements, threaded by lengths of knotted string. Robinson’s cartoons were so popular that in Britain the term “Heath Robinson” is used to refer to an improbable, rickety machine barely kept going by incessant tinkering. (The corresponding term in the U.S. is Rube Goldberg, after an American cartoonist with an equal devotion to odd machinery. Similar “inventions” have been drawn by cartoonists in many countries, with the Danish Storm Petersen being on par with Robinson and Goldberg.) One of his most famous series of illustrations was that which accompanied the Professor Branestawm books by Norman Hunter. The stories told of the eponymous professor who was brilliant, eccentric and forgetful and provided a perfect backdrop for Robinson’s drawings.One of the automatic analysis machines built for Bletchley Park during the Second World War to assist in the decryption of German message traffic was named “Heath Robinson” in his honour. It was a direct predecessor to the Colossus, the world’s first programmable digital electronic computer. British novelist, short story writer, poet, fighter pilot & screenwriter Roald Dahl was born 13 September 1916 in Llandaff, Cardiff, Wales. He was named after the polar explorer Roald Amundsen, who was a national hero in Norway at the time. Dahl first attended The Cathedral School, Llandaff. At the age of eight, he and four of his friends (one named Thwaites) got into serious trouble after putting a dead mouse in a jar of gobstoppers at the local sweet shop,which was owned by a “mean and loathsome” old woman called Mrs Pratchett. This was known amongst the five boys as the “Great Mouse Plot of 1924″ Thereafter, he transferred to Saint Peter’s Boarding School in Weston-super-Mare, and in 1929, he attended Repton School in Derbyshire, During his school years He was never seen as a particularly talented writer , although He excelled at sports, and was made captain of the school fives and squash teams, and also played football. As well as having a passion for literature, he also developed an interest in photography and often carried a camera with him. During his years at Repton, Cadbury’s, would occasionally send boxes of new chocolates to the school to be tested by the pupils. Dahl apparently used to dream of inventing a new chocolate bar that would win the praise of Mr. Cadbury himself; and this proved the inspiration for him to write Charlie and the Chocolate Factory, and include references to chocolate in other books. His first job of selling kerosene in Midsomer Norton and surrounding villages in Somerset, south West England is also a subject in Boy: Tales of Childhood.After finishing his schooling, he went hiking through Newfoundland with the Public Schools’ Exploring Society (BSES Expeditions). and in July 1934, joined the Shell Petroleum Company, & after two years of training, he was transferred to first Mombasa, Kenya, then to Dar-es-Salaam, Tanzania. In August 1939, as World War II loomed, plans were made to round up the hundreds of Germans in Dar-es-Salaam. Dahl was made an officer in the King’s African Rifles, commanding a platoon of Askaris, indigenous troops serving in the colonial army. In November 1939, Dahl joined the Royal Air Force as an Aircraftman and was promoted to Leading Aircraftman on 24 August 1940. Following six months’ training on Hawker Harts, Dahl was made an Acting Pilot Officer. He was assigned to No. 80 Squadron RAF flying obsolete Gloster Gladiator biplanes, but did not receive any specialised training in aerial combat, or in flying Gladiators. Sadly during one mission, he was forced to attempt a landing in the desert because he was running low on fuel and night was approaching, unfortunately the undercarriage hit a boulder causing the aircraft to crash, fracturing his skull, smashing his nose and temporarily blinding him. luckily He managed to drag himself away from the blazing wreckage and passed out and was rescued and taken to a first-aid post in Mersa Matruh, then taken by train to the Royal Navy hospital in Alexandria. After his recovery, Dahl took part in the “Battle of Athens”,On 20 April 1941, alongside the highest-scoring British Commonwealth ace of World War II, Pat Pattle.In May, Dahl was evacuated to Egypt and flew sorties every day for four weeks, shooting down a Vichy French Air Force Potez 63 and a Ju-88, but he then began to get severe headaches that caused him to black out, so He was invalided home to Britain. Though at this time Dahl was only a Pilot Officer on probation, in September 1941 he was simultaneously confirmed as a Pilot Officer and promoted to war substantive Flying Officer. Dahl began writing in 1942, after he was transferred to Washington, D.C. as Assistant Air Attaché. His first published work was “Shot Down Over Libya” which described the crash of his Gloster Gladiator. C. S. Forester also asked Dahl to write down some RAF anecdotes so that he could shape them into a story. After Forester read what Dahl had given him, he decided to publish the story exactly as Dahl had written it. The original title of the article was “A Piece of Cake” but the title was changed to sound more dramatic, despite the fact that he was not actually shot down. Dahl was promoted to Flight Lieutenant in August 1942. During the war, Forester worked for the British Information Service and was writing propaganda for the Allied cause, mainly for American consumption. This work introduced Dahl to espionage and the activities of the Canadian spymaster William Stephenson, and Dahl supplied intelligence from Washington to Stephenson and his organisation known as British Security Coordination, which was part of MI6, where he worked with other well-known officers such as Ian Fleming and David Ogilvy. After the war Dahl held the rank of a temporary Wing Commander (substantive Flight Lieutenant)in August 1946 he was invalided out of the RAF. He left the service with the substantive rank of Squadron Leader. His record of at least five aerial victories, qualifying him as a flying ace.After the war Dahl went on to become one of the world’s best-selling authors, writing works for both children and adults and has been referred to as “one of the greatest storytellers for children of the 20th century”. In 2008 The Times placed Dahl 16th on its list of “The 50 greatest British writers since 1945″. His short stories are known for their unexpected endings, and his children’s books for their unsentimental, often very dark humour. Some of his notable works include James and the Giant Peach, Charlie and the Chocolate Factory, Matilda, The Witches, Fantastic Mr Fox, The Twits, George’s Marvellous Medicine and The BFG. In the 1986 New Years Honours List, Dahl was offered the Order of the British Empire (OBE), but turned it down, purportedly because he wanted a knighthood so that his wife would be Lady Dahl. Dahl is the father of author Tessa Dahl and grandfather of author, cookbook writer and former model Sophie Dahl (after whom Sophie in The BFG is named). sadly Dahl passed away on 23rd November 1990 at the age of 74 of a blood disease, myelodysplastic syndrome, in Oxford, and was buried in the cemetery at St Peter and St Paul’s Church in Great Missenden, Buckinghamshire, England. Priestley’s first major success came with a novel, The Good Companions (1929), which earned him the James Tait Black Memorial Prize for fiction and made him a national figure. His next novel, Angel Pavement (1930), further established him as a successful novelist. However, some critics were less than complimentary about his work, and Priestley began legal action against Graham Greenefor what he took to be a defamatory portrait of him in the novel Stamboul Train (1932).In 1934 he published the travelogue English Journey, which is an account of what he saw and heard while travelling through the country in the autumn of the previous year. He moved into a new genre and became equally well known as a dramatist. Dangerous Corner was the first of a series of plays that enthralled West End theatre audiences. His best-known play is An Inspector Calls (1945), later made into a film starring Alastair Simreleased in 1954. His plays are more varied in tone than the novels, several being influenced by J. W. Dunne’s theory of time, which plays a part in the plots of Dangerous Corner (1932) and Time and the Conways (1937).Many of his works have a socialist aspect. For example, An Inspector Calls, as well as being a “Time Play”, contains many references to socialism — the inspector was arguably an alter ego through which Priestley could express his views. Priestley’s ‘Inspector Calls’ appears to simply tell the story of a young girl called Eva Smith and her tragic suicide. However, in reality it also mentions Priestley’s views on socialism’. During World War II, he was a regular broadcaster on the BBC. The Postscript, broadcast on Sunday night through 1940 and again in 1941, drew peak audiences of 16 million; only Churchill was more popular with listeners. But his talks were cancelled. It was thought that this was the effect of complaints from Churchill that they were too left-wing; however, Priestley’s son has recently revealed in a talk on the latest book being published about his father’s life that it was in fact Churchill’s Cabinet that brought about the cancellation by supplying negative reports on the broadcasts to Churchill. Priestley chaired the 1941 Committee, and in 1942 he was a co-founder of the socialist Common Wealth Party. The political content of his broadcasts and his hopes of a new and different England after the war influenced the politics of the period and helped the Labour Party gain its landslide victory in the 1945 general election. Priestley himself, however, was distrustful of the state and dogma.Priestley’s name was on Orwell’s list, a list of people which George Orwell prepared in March 1949 for the Information Research Department, a propaganda unit set up at the Foreign Office by the Labour government. Orwell considered these people to have pro-communist leanings and therefore to be inappropriate to write for the IRD. He was a founding member of the Campaign for Nuclear Disarmament in 1958. In 1960, Priestley published Literature and Western Man, a 500-page survey of Western literature in all its genres, including Russia and the United States but excluding Asia, from the second half of the 15th century to the present (the last author discussed is Thomas Wolfe).Although Priestley never wrote a formal book of memoirs, his literary reminiscences, Margin Released (1962), provide valuable insights into his work. The section dealing with his job as a teenage clerk in a Bradford wool-sorter’s office manages to weave fine literature from an outwardly unpromising subject — a characteristic of many of his novels.His interest in the problem of time led him to publish an extended essay in 1964 under the title of Man and Time (Aldus published this as a companion to Carl Jung’s Man and His Symbols). In this book he explored in depth various theories and beliefs about time as well as his own research and unique conclusions, including an analysis of the phenomenon of precognitive dreaming, based in part on a broad sampling of experiences gathered from the British public, who responded enthusiastically to a televised appeal he made while being interviewed in 1963 on the BBC programme, Monitor. Priestley was also one of the interviewees for the documentary series The World at War (1973), in the episode “Alone: May 1940 – May 1941”. He declined lesser honours before accepting the Order of Merit in 1977.The University of Bradford awarded Priestley the title of honorary Doctor of Letters in 1970, and he was awarded the Freedom of the Cityof Bradford in 1973. His connections with the city were also marked by the naming of the J. B. Priestley Library at the University of Bradford, which he officially opened in 1975. Priestly sadly passed away on 14 August 1984 However hee is commemorated by the larger-than-life statue of him, commissioned by the Bradford City Council. after his death, and which now stands in front of the National Media Museum in Bradford.A special collector’s edition of Bright Day was re-issued by Great Northern Books in 2006, celebrating the 60th anniversary of the publication of this novel.